Yeah. I know. Starting a new series with a bit of 1990 whatever that was. Bodes well, eh? Don’t worry. You’ll get used to it. After all, U can’t touch this. 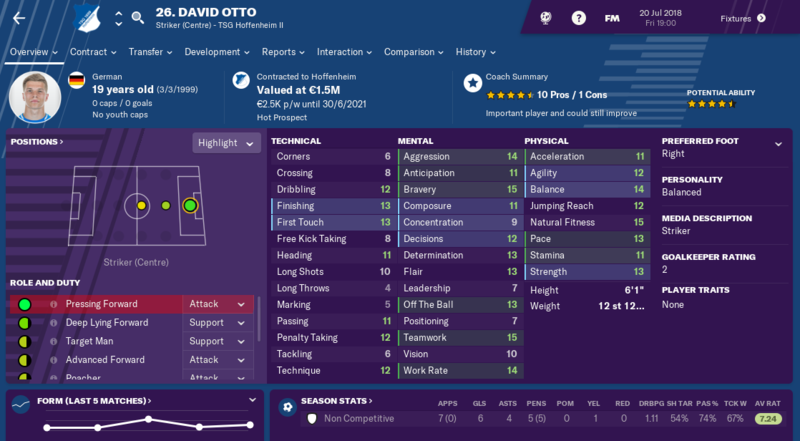 So, Football Manager 2019 has been a cruel mistress. As I said in yesterday’s post, I haven’t really got my teeth into it properly due to real life stuff, a lack of tactical enjoyment straight off the bat upon release and not finding a connection with a club. All that seems to have changed. I have a little more free time right now or at least time that I am putting aside to nail this save. I’ve stumbled across a tactical style that I am enjoying watching play out having messed about in the USA for a while thanks to a very cool database put together by Uncle Sam. And, finally, I have a challenge and a narrative that works in my head so there is every chance I might stick this out for a few seasons. And if I don’t? Nobody is reading this anyway. I am talking to myself. Yep, FM blogging is back. 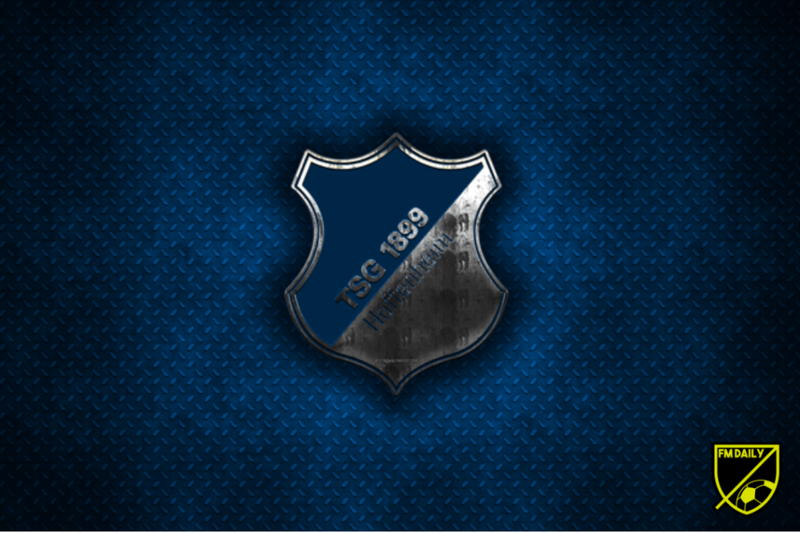 Why Hoffenheim? Well, it’s not even Hoffenheim, really. It’s their B team. I’m going back into B team management because I find it bloody hard work and bloody good fun. That delightful mix of not knowing what players will be stolen from my squad by Julian Nagelsmann when I am about to select my team for the weekend or, worse, the board loaning them out to some team at the bottom of 2. Bundesliga, I’d imagine. 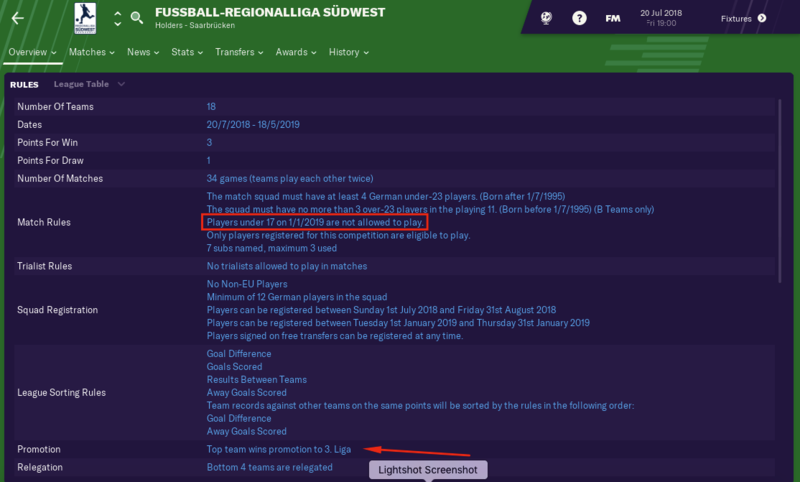 Throw in a little bit of blooding kids from the U19 squad before they are ready and being given a backroom team the size of most club’s playing squads in the Regionalliga and I’ll be laughing. That said, I could have chosen loads of other B teams so why did I opt for Hoffenheim? With the challenge being trying to get a job in either the English Championship off the back of what I do in this first role OR getting the first-team gig at Hoffenheim I felt I needed a club that could give me a little chance of being successful. Bayern or Borussia Dortmund could have been too easy but, on the opposite side of the same coin, too hard to get the first-team job. Hoffenheim feels like both exit routes might be achievable and they do have form for promoting from within; Nagelsmann himself was the U19 manager before taking the first-team gig. 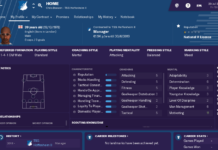 Whilst it is great that the FM19 database is nicely up to date and all that, it makes it very unlikely that I will be succeeding Nagelsmann however well I do. I do love an infographic. The reason I want to have a relatively clear plan in my head is so that I don’t veer from it too dramatically and screw everything up after a couple of seasons. I will try and hold myself to that as best I can. And, of course, I could be sacked at any moment. What about the task ahead of me? We start life in Regionalliga Sudwest. Let’s have a look at some of the rules and regulations, mainly so I don’t fall foul of them. As you can see, only the top team goes up. And, players under 17 cannot play – which rules out a fair chunk of the U19 squad if my board get a little loan-happy. It’s a tough division too, to be fair. Saarbrucken are the clear favourites for the title followed by FSV Frankfurt and Mainz II. 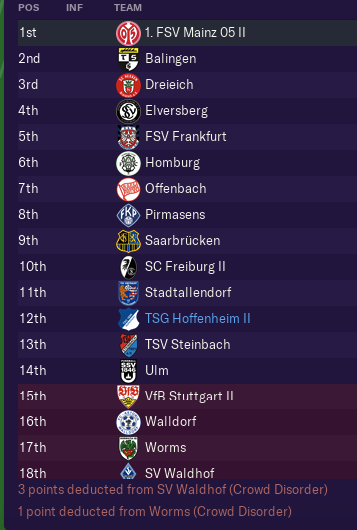 Now, we beat Frankfurt pretty easily in preseason as well as Worms so I have every confidence we are going to be very competitive in this division but one team promoted? No space for slip-ups at all. There’s no real point me showing you my squad as one thing I have learned from previous B team stints is that you put a lot of elbow grease into prepping and talking about your prep in pre-season only for the squad you had in mind to be decimated come the first league match. Have we had a good pre-season? Yes, it’s been great thanks. Does it mean anything? Ask me after a few games and I know what my squad might actually look like. I mean, we have this lad right now. I’d love to get excited about how he will score the goals that wins me my first title. But I cannot. I have no idea if the first-team will take him or if he gets loaned out to a higher level for his development. There’s a few like that. Anyway, by the time I return tomorrow, we will have a few league games under our belt and I can tell you some more. Previous articleIs there a comeback on the cards?